You’ve decided that you’d like to read the Bible, but where do you begin? We've put together some handy guides to get you started. New to the Bible and not sure where to begin? Here are three top tips to get you going. One of the most asked questions about the Bible is 'what is the best translation?' It all depends on who you are and what you will be using it for. It's possible to trace a story that runs through all the books from beginning to end. These 40 steps carry you through the story of God’s love for the world he created. Christians believe that when they read the Bible God speaks. 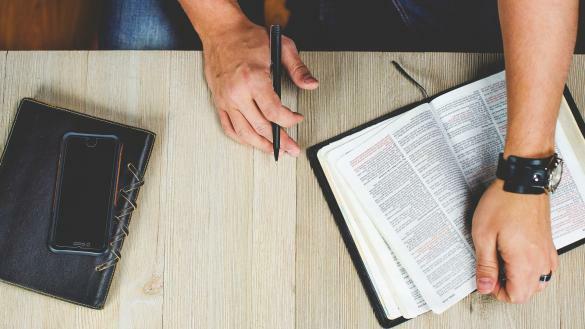 If you are new to Bible reading as a Christian it is important to recognise that reading the Bible is slightly different to reading other books. How about reading some of the Bible's best-loved and best-known stories. What does Jesus mean when he says 'Be perfect...'? What does the Bible say about the mercy of Jesus? Tom's half way through Bible in a year! Take a look at our tips on reading the Bible and looking at particular themes within Scripture. Find out about the Bible, and its history, also try using our improved Bible search to find the passage you're after, or search the Bible by keyword. Find out how we work and where we work to bring the Bible to life for communities all over the world.